Kristjan-Robert had been going to Europeade festival for already more than 10 years alone and wanted to bring friends with him. In 2014 the festival was happening in Poland. First trying to ask people to come and join with him wasn't so hard, Martti Laas joined for bass guitar and Karl Helmeste joined for drums. All very good friends, but not the most bravest singers, so they found 3 singers to join them - Steffi Pähn, Tiina Adamson and Lizette Vetik. Something was still missing from the sound and to cure that problem, they found Eliisa Elfenbein for soprano saxophone. It was a fun festival and one of the biggest experiences, Robert has seen so far. From the first day on, the trip didn't make it easy for us. Our rented bus, didn't have working A/C, which meant that first day we drove with open windows. Next to that the bus stopped working properly in Latvia, so we had to change our bus in Lithuania. Who forgot their passports home, who forgot shoes, concert clothes etc, who got lost and who went to clubs every night, we're not going to mention, but it all happened. 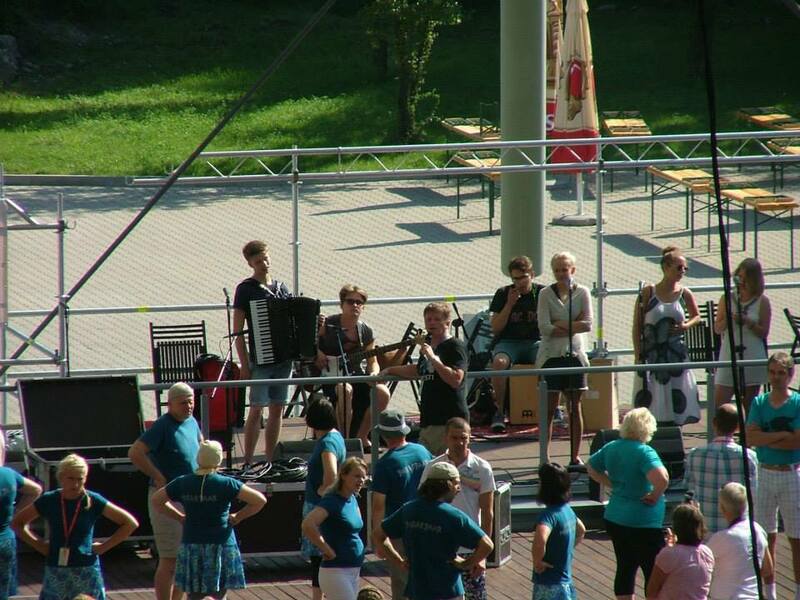 We had a blast playing for more then 5000 people on Saturday evening in the city Kielce. It was a amazing experience, everyone dancing, jumping and singing with us. There was a lot of Estonian people also in the festival, who all supported us in a way, what is not imaginable. In that festival we played about 10 gigs, smaller and bigger and also accompanied Estonian folk-dancers in the festival main event. In the last day of the festival we decided, that if we're already in Poland, we should also go to Slovakia. The drive to Slovakia was incredible, though it was completely dark, non of us had ever seen so many animals, and specially running on the streets. After arriving back from Slovakia to Estonia we had a concert in Kostivere, where we were one of the main acts on their festival day. Also we performed the whole International Music day all over Southern-Estonia and gave a concert with some of our own music in Käru. During the year 2015 our band got a completely new face, with three new singers and some new music. We had couple of performances in the first half of the year and we again worked for Europeade festival. In the group we welcomed singers Marianne Leibur, Silvia Vahu and Ann Mäekivi, all the other members stayed the same. We tried to write our own music and make rehearsals, but we managed to write only couple of new tunes, but we never recorded them. Some of them are still in our repertoire, but most of them are not and we don't even know them anymore. That year, the festival took place in Sweden. That meant a small travel, compared to the year before. We were the only musicians to perform with Estonian dancers and played for children in many occasions. That year we decided to also bring our own sound system, that we could make small jams everywhere we are. We played out of blue concerts in the centrum of Helsingborg, which gathered a lot of people and we played for hours. Bars loved us, because we brought a lot of people to their places. We had a good friend with us Ramuel Tafenau, who also played drums in our band in occasions when no one else could do it. Later that year, Robert moved to Amsterdam to go on with his studies, so the band stopped working all year long. During the first year away, Robert was sure that the band is not going to yet another Europeade festival, but he was wrong, and the planning to go to Belgium started. It was a big change for our band that year, because we didn’t exist as proper band anymore, because Robert moved to Amsterdam for his studies. Although we didn’t rehearse before the summer or didn’t even see each other before the summer we still managed to play at Europeade festival that summer in Namur, Belgium. We welcomed another two new singers, new drummer and for the first time proper guitar player to our band. Vivi and Viveli Maar on vocals, Karl Madis Pennar on electric guitar and Rando Lilleorg on drums. We still had Martti Laas on bass and Eliisa Elfenbein for the last year on saxophone. The twins brought us a lot of attention, which was of course good. We gave couple of concerts in the festival and had one of the best energy concerts so far with the group. It was on Saturday evening, it was late and we had so much energy on stage that all of us needed to change clothing after only 25 min of playing. Sometimes musicians say that “it was happening” and that was one of these moments. That feeling was one reason why Robert kept on doing this band even though he lived 2000km away from everyone else in the band. We traveled trough Estonia, Latvia, Lithuania, Poland, Germany, Netherlands, Belgium, Denmark and Sweden. We visited a lot of beautiful cities and enjoyed the beautiful surroundings of Southern Belgium and Sweden a lot. Was that a year. Pillikud after having hard time last year to even get a band together was this year in a position of having too many people, so they decided to make two different bands, one which is performing Pillikud’s music and couple of covers of other Estonian similar bands (Zetod, Vägilased) and another called Merelinlased which performed more traditional Estonian folk (read. something played on a midsummers eve or in a village party). All together we were 11 people and we went to the Europeade festival in Turku, Finalnd. In the festival we played a lot of concerts with both of the groups, I think around 14 all together. In that festival we had in Pillikud Jana Kütt (1st time), Ann Mäekivi, Marianne Leibur, Silvia vahu (all 2nd time), Tobias Tammearu (sax, 1st time), Karl Madis Pennar (guit. 2nd time), Martti Laas (4th time), Karl Helmeste (3rd time). Merelinlased: Martin Trudnikov (accordion), Karl Madis Pennar (guitar), Robert Rebane (ac.guitar, accordion), Martti Laas (bass), Ramuel Tafenau (2nd time, drums). We gave a lovely choir evening concert, what started at 19:00 on Saturday evening and we trying to be as spontaneous as possible we started to rehearse at 19:00 still at home. We came up with a tune called Viire Takka, which is a old lullaby from Estonian islands. We made a quick arrangement and tried to not sing it too much to keep it as fresh as possible. That’s the result. Also you can hear a some music clips by the Merelinlased (Kaabikud with new name).